Seriously, I really honestly am. 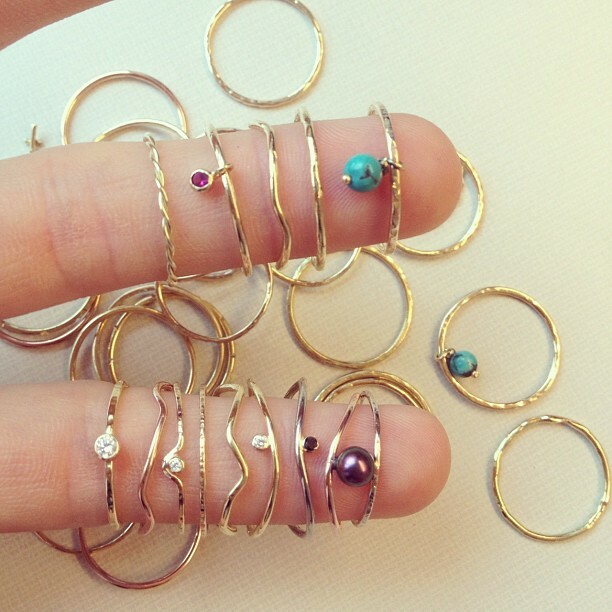 This top photo features a selection of Anne Sportun rings, a Toronto based designer whom we did a buy with this morning. All of these pieces, with the exception of the spectacular pear shaped diamond slice will soon be available at the Magpie Jewellery brick and mortar locations. The pear shaped diamond is a one of a kind piece that retails for approximately 15K and can be brought in upon request. This second image features a local Ottawa designer whose tiny rings have been a growing obsession of mine over the past few months. I have shared a few images of these tiny rings in the past as the collection, before we knew it to be a collection began to take shape. I am pleased to say that this product has translated into a wonderful brand that will soon be available for purchase. I adore that each of these rings are individually handmade, locally and that their designer has been putting up with my shenanigans. These rings are made of pure yellow, red (rose) or white gold and yes, some feature black or white diamonds, pearls and other precious stones. My obsession with black diamonds knows no bounds, seriously. labels: Anne Sportun, magpie jewellery, W.
Love the tiny gold rings - I've been searching for these for months! Where can we buy them?